Passing variable values through driver script. Value for variables can be passed as arguments in a driver script. The only requirement is that they should be provided in the same order as they are declared. We have two scripts here one is the main code (driven) script and the driver script. 2. Import project in eclipse and convert it to AspectJ by following steps mentioned on “https://tfortesting.wordpress.com/2012/08/31/steps-to-install-monkeytalk-android-agent/ “link. 4. Deploy your application to an Android device or emulator. 5. Open app in emulator for which you want to record script. 6. Open MonkeyTalk IDE and Click on the connection dropdown button on the tool bar (on initial start up it will be the green android icon). 7. Choose “Android Emulator” or “iOS Simulator”. 8. If connection was successful, a message to that effect should appear in the console. 10. 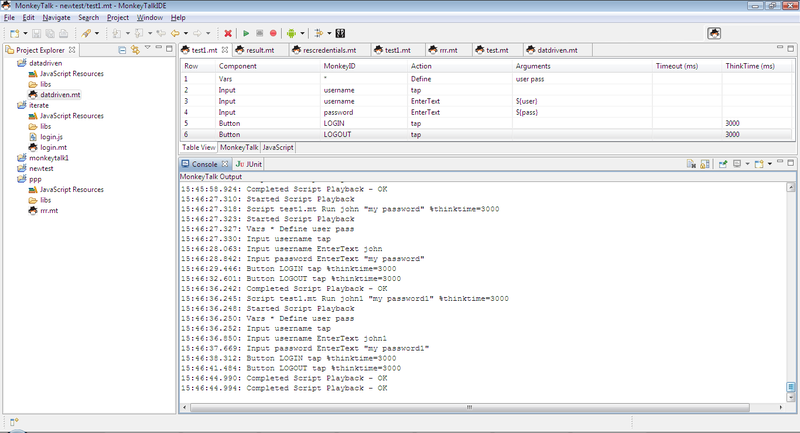 Create a MonkeyTalk project in MonkeyTalk IDE. 11. Then Create script under this MonkeyTalk project and Click on record button. Installing App in Emulators need the .apk file which we can find in the sameproject folder. Way 1: If we are using Eclipse version 3.7.2, then on executing the Android project in Eclipse (without throwing any error) will automatically install the App (.apk file) in emulator (make sure the Emulator is open while executing the Eclipse Android project). Way 2: We can also install the Android App (.apk file) through ‘adb’ (Android Debug Bridge). adb is a versatile command line tool that lets you communicate with an emulator instance or connected Android-powered device. ‘adb’ used for installing any App in Android. As per mentioned command in screenshot is used for installing any app. In order to start with Mobile App testing, there are some pre-requisites software/packages which we need to install/unzip on machine. •‘Android Virtual Device Manager’ window will be open. • Start Eclipse> Help > Install New Software…. • Click Add, in the top-right corner. Now while looking on the Eclipse, TWO newly added icons will be shown. These TWO icons are for ‘AVD Manager’ and ‘Android SDK Manager’. For installing the Monkey Talk Android Agent, first we need to convert Android project into AspectJ. Click Ok. It will configure the AJDT with Eclipse. Verified that Alignment should be proper.Expected result: Alignment should be proper. Check each and every buttons, images Pixels as per wire frame/page schematic or screen blueprint.Expected result: Dimensions must be same as defied in wireframe. Verify that Proper images size displayed in well manner with Orientation. Verify that all Spell check are correct on Alert, error popup,Error messages etc. Verified that Spinner (Size, Types) should be suitable as per screen. Verify that Font size should be consistent. Verify that any kind of text should not be cutting off. Verify that application must not perform inappropriate actions while thinking or rendering by making user input while the application or handset is busy processing or rendering.There must be no inappropriate reaction by the Application. Verify that On Taping (Single Tap) Application Logo , Application Splash should display. Verify that there is visual feedback when response to any action takes more than 3 seconds. Verify that each screen should be visible for the time necessary to comfortably read all its information by moving between screens of an application. Each screen must be visible for the time necessary to comfortably read all its information. Verify that error messages in the Application must be clearly understandable. Verify that error messages must clearly explain to a user the nature of the problem, and indicate what action needs to be taken (where appropriate). Verify that any function selected in the Application should start within 5 seconds. Verify that If the screen contains dates, numeric, currency or other specific data types, ensure that only valid data can be entered. Verify that If the screen contains text boxes that allow data entry, ensure that the width of data entered does not exceed the width of the table field. If the information in the screen is not self-explanatory to the casual user, should provide onscreen instructions to aid the user. If the screen takes more than 5 seconds to display the results/page, it should contain a progress bar so that the user understands the processing is continuing. The screen look, feel, and design should match the other screens in your application. (Application should match with the Wireframe or design document provided). If the screens contain abbreviations (e.g. Nbr for number, Amt for amount, etc), the abbreviations should be consistent for all screens in the application. If the screen allows changing of data without saving, it should prompt users to save if they move to another record or screen. If a person deletes an item, it is a good idea to confirm the delete. User should be prompted with confirmation alert. If the user interface uses combo boxes (drop down lists), be sure to include type ahead (if there are hundreds of items in a list, users should be able to skip to the first item that begins with that letter when they type in the first letter). Ensure the test cases look for grammar or spelling errors. If the application lists information in table format and the data in the table extend past one page, the scrolling should scroll the data but leave the table headers intact. If fatal errors occur as users use your application, ensure that the application writes those errors to a log file, event viewer, or a database table for later review. Log the routine the error was in, the person logged on, and the date/time of the error. Ensure that error messages are informative, grammatically correct, and not condescending. Do not show menu items that are not available for the context users are currently in. Use a style guide to document what choices are available for dialog boxes. Application should not have Save/Cancel dialog on one screen and an OK/Cancel on another. This is inconsistent. Ensure that the screen font family matches from screen to screen. Mismatching fonts within the same sentence and overuse of different fonts is not allowed. Ensure that the screen font sizes match from screen to screen. A good user interface will have an accompanying style guide that explicitly defines the font type and size for headers, body text, footers, etc. Ensure that screens do not use different color sets as to cause an inconsistent.style guide should define header colors, body background colors,screen background color, footer colors, etc. Ensure that icons are consistent throughout your application by using a common icon set. For example, a BACK link that contains an icon next to it should not have a different icon on one screen versus another. Avoid free clip-art icons. Ensure that narrative text appears at the same location on the screen on all screens. Ensure that narrative text, error messages and other instructions are presented in laymen’s terms but are brief and to-the-point. If your application has links on the screen (e.g. Save as Spreadsheet, Export, Print, Email, etc. ), ensure that the links have consistent spacing between them and other links, that the links appear in the same order from screen to screen, and that the color of the links are consistent. If your application has menu items, ensure that menu items that are not applicable for the specific screen are disabled and the order in which each menu item appears is consistent from screen to screen. If your application has buttons (e.g. Submit, OK, Cancel, etc), ensure that the buttons appear in a consistent order from screen to screen (e.g. Submit then Cancel).